View More In Picture Hangers. 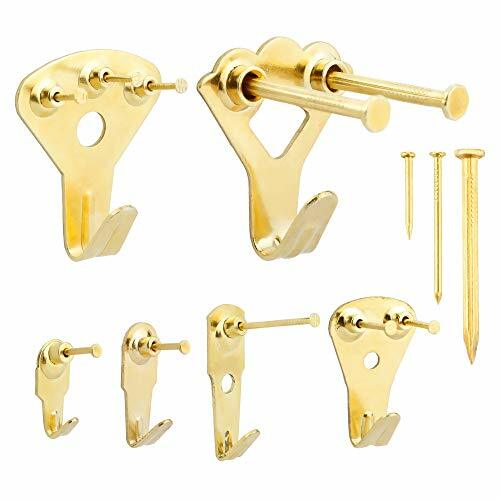 ONEONEY 205 Pcs Picture Hangers Durable Golden Picture Photo Frame Hooks for Wall Mounting with Pin Nails, 10-100 lbs. They are usually used in museums and galleries to hang light and heavy objects. Get yours today and make your home happy. Your home will love this kit. Professional Picture hangers are easy to use, it can be applied in drywall and don't damage it. Your home will love the hangers,Get them today and make a family full of artistic atmosphere. Picture hanging including 10 lbs,20 lbs,30 lbs,50 lbs,75 lbs and 100 lbs,supports various objects sizes for you to use according to your needs. Strong and resistant,made to support items with up to 100 lb.Heavy duty and more resistant,perfect to works of art and decorative items. DON'T WORRY to damage your wall; Tidy Nails won't damage walls; Easily to remove, just will leave a small pin hole. 300*10lb Hangers, 200*20lb Hangers, 20*30lb Hangers, 10*50lb Hangers, 5*75lb Hangers, 5*100lb Hangers; 50*Small Nails, 55*Medium Nails, 10*Large Nails. Great to Works of Art and Decorative Items, Fits for Home, Office, or Anywhere You Need A Hang. If you have any questions about this product by ONEONEY, contact us by completing and submitting the form below. If you are looking for a specif part number, please include it with your message.